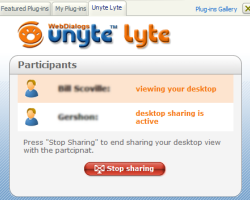 Unyte Lyte provides 1:1 desktop sharing to Yahoo users. With one click invite contacts from your Yahoo! Messenger list to "see" your desktop. Review homework, play new games, co-browse, edit documents, demonstrate software, give presentations. Read Manas's review on Tech One or download this plugin directly.